UK government body the Intellectual Property Office is the latest victim of protest group Anonymous’ Operation Payback. Aimed at pushing for copyright law reform, Operation Payback has been using DDoS attacks to take down websites related to music and film industry bodies among others that Anonymous sees as its enemies. According to TorrentFreak, The attack on the IPO website began yesterday and at the time of writing it is still inaccessible (UPDATE: the IPO tells us that they took their website offline shortly after the attack began, see statement below). The IPO’s role in the UK is to look after intellectual property rights in areas such as trademarks and patents. According to a screenshot posted yesterday by Slyck, Anonymous has chosen to attack the body for “Perpetuating the system that is allowing the exploitative usage of copyrights and intellectual property”. Two days ago we reported on Anonymous’ attack on US film industry website CopyProtected.com. In that case, the group opted for a different approach to the usual DDoS. An essay explaining the its motives was published, replacing the site’s usual content for several hours. “The Intellectual Property Office chose to disconnect it’s website from the Internet following a coordinated Distributed Denial of Service (DDoS) attack on Saturday 16th of October at around 18:00 BST. As part of our standard network security procedures, our main services were protected prior to the attack. The website and our internal services suffered no harm. We are preparing to resume services as soon as possible. 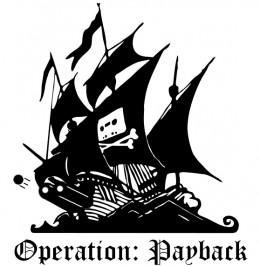 The attack was orchestrated by “Operation: Payback” which is an ongoing campaign against major anti-piracy groups. The organisers say that they have targeted us as we are “perpetuating the system which is allowing the exploitative usage of copyrights and intellectual property”. They commenced a DDoS attack against the IPO website at around 18:00 BST on Saturday 16th of October. Our website is currently unreachable as we worked with our Internet Service Provider (ISP) in order to move our web services out of harm’s way. DDoS attacks on websites of this kind obstruct access by ordinary citizens to government services. Read next: Professionalism: Reporter gets bum pinched live on air, carries on reporting.